I’ve always wondered just how much gas our country uses unnecessarily. I’ll start with, of course, NASCAR. Never a fan of watching cars go around in circles for four hours while sporting a fashionable farmer’s tan, I can’t even begin to imagine how much gas is wasted at just one NASCAR event. Before becoming a political science major, I took a few business classes, including economics, so I think I understand supply and demand. The more we use… the more it costs. I know there is more to it, but I like to think it’s that simple. As I thought about it further, and with a presidential campaign now in full swing, I wonder how much gas each presidential candidate is using as he campaigns across the country? My research shows most coach buses get about 9-14 mpg at best. 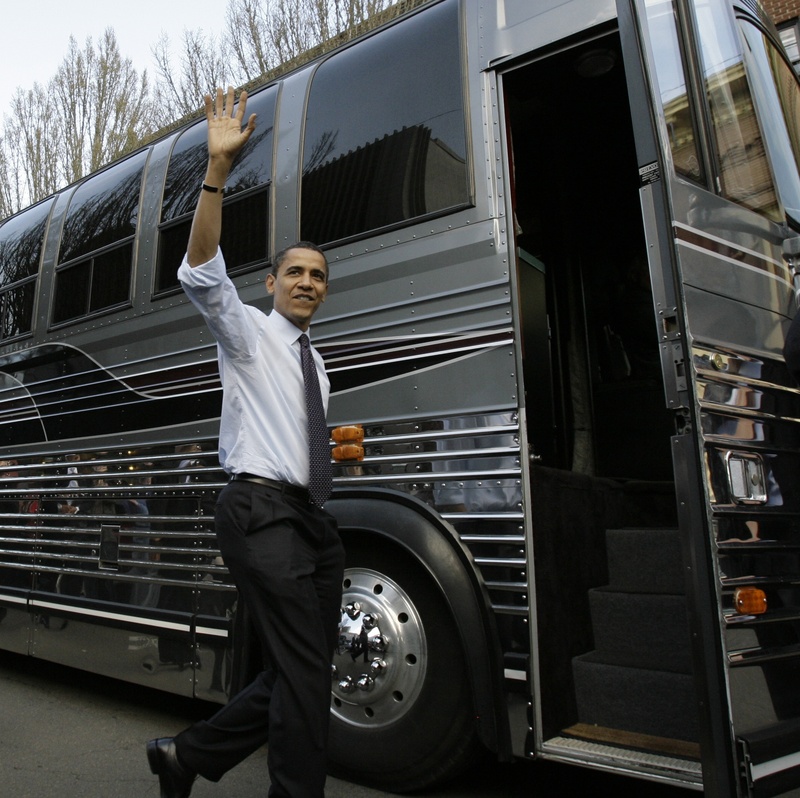 Naturally, not everybody can fit on the bus so support staff, reporters, photographers and protesters travel around in separate cars to get to campaign events. I imagine it looks much like a soccer game between five-year-olds. Everyone is running around following the ball and not really accomplishing anything (rest assured, your kid is an All-Star). So each candidate tells us he has a plan to bring the cost of fuel down, yet each has spent the last 17 months travelling around the country using up massive amounts of gas and limiting the amount that’s available to Americans trying to go to work and make something for themselves… thus driving costs up. With a little more than four months until Election Day, imagine if the candidates made a pact to use less gasoline as they travel around the country. Not only would the candidate show the American people that we all need to cut back on our fuel consumption, but it would change the way candidates campaign from here on out. Because by not driving to and from campaign events – or at least driving less – the candidates would naturally turn to social media, video integrated marketing and other creative ways to reach out and communicate with voters. We have seen how social media can severely impact a campaign (see here) but think about all the positive ways social media could be used throughout the campaign. Candidates could blog with supporters, join a web video conference or send web video to their e-mail list. Each of these tactics connect with the voter on a more personal level than another flyer stuffed into the mailbox or sitting at the top of an arena after waiting in line for six hours. And while candidates can never really get away from traditional campaigning, increasing their use of social media marketing is certainly in their best interest. If for no other reason than it helps out the campaign treasurer fill out those campaign finance reports.